We will recover your website from Google penalty. Guaranteed! With years of proven experience, we are confident to provide Google penalty removal as a service. Our team has convinced so many website owners with positive results, that we can GUARANTEE successful link-related penalty removal. We will not stop until we get your Manual or Penguin penalty lifted! We do not stick to your wallet demanding regular payments. You got an issue – we come and fix it. Simple as that! 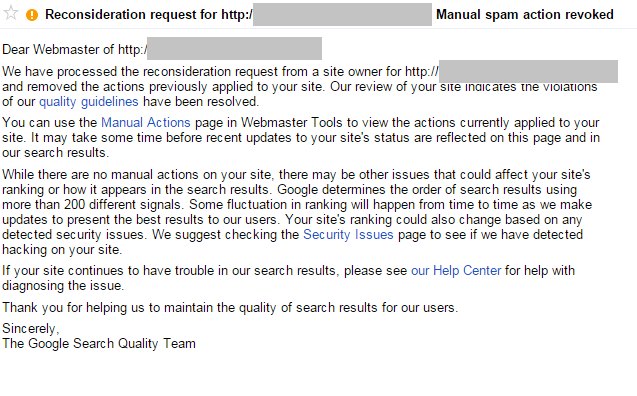 Proven Google penalty recovery. What is the secret? The secret is in thorough MANUAL backlink profile review and doing everything exactly as Google is expecting you to do. By delegating this work on us, you will save your time and increase chances to 100%. Since we do it on a daily basis, we will do it faster and at less price! Every situation is unique and we do not use cookie-cutter approach. While our business process looks typical, we pay attention to your website situation and communicate with you as much as possible. We aggregate backlink profile from all possible sources: Google Webmaster Tool, AHREFS, Majestic SEO, Moz OSE. Yes we actually open each page with a link pointing at your site and check out if it is safe or not. Along with that, we have our knowledge base, a set of tools and methodology to make sure nothing is missed. We use a software to find out contacts, reach out to all webmasters, and ask them to remove links accordingly. We believe that this stage is necessary even with algorithmic Penguin penalty. Reconsideration is done for Manual penalty. Sometimes it takes a couple of tries, but we often get a Penalty Revocation letter from the very first try! In case of Penguin we recommend and do another backlink review and clean-up in 2-3 month to make sure that by the time of next Penguin update your website is as clean as possible. We provide comprehensive reporting on every stage.